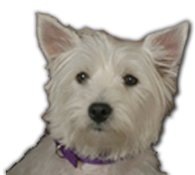 The West Highland White Terrier or "Westie" was officially recognized as a breed in 1909. A descendant of the Scotland Terrier family, the Westie shares their lineage with the Scottie, the Cairn and the Dandie Dinmont. Legend says that the deliberate breeding of white terriers began in the 1850s. The accidental shooting of a reddish terrier by Colonel E. D. Malcolm of Poltalloch Scotland is said to have been the inspiration for the Westie. Upset by his mistake Malcolm vowed to never mistake a dog for a fox again and began selectively breeding white terriers. He reasoned that white terriers would be much easier to distinguish from the quarry. It had been common to destroy white puppies from litters prior to this due to the belief that they were inferior pups. Malcolms efforts were key to changing this belief. The white terriers that resulted proved themselves every bit as capable as their darker haired cousins. By the 1900s white was the desired standard. The Westie is big enough to really be a dog but small enough to go in the car or share your chair. They enjoy the outdoors, regardless of the weather, but fit nicely into a small apartment. They look like a stuffed toy, but they are wonderfully alive!